Wash eggplant and cut lengthways in 1cm thick pieces. Sprinkle with salt and leave 30 minutes. Rinse eggplant, pat dry then brush with a little vegetable oil on both sides. 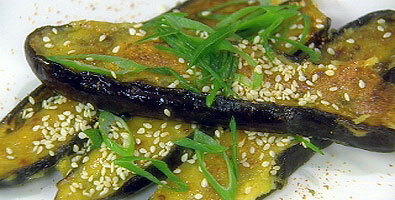 Either barbeque, grill or panfry eggplant until soft. In a bowl mix together miso, sugar, sake, mirin, sake and egg yolk. On a baking tray, spread one side of the eggplant with miso mix. If you like it hot, sprinkle the Japanese chilli five spice on now. Grill for a few minutes until the miso bubbles on top. Serve on a plate, sprinkled with sesame seeds and garnished with the julienned spring onion greens.